Exclusive: questions are being asked about shootings involving US marines which left over a dozen people dead after an international lawyer said evidence examined by Channel 4 News could indicate "war crimes" in Afghanistan. Channel 4 News has been unable to independently verify the authenticity of the Wikileaks files. Wikileaks founder Julian Assange insists that within the 90,000 US military field reports from the war in Afghanistan between 2004 and 2009, is "prima-facie" evidence of "war crimes". He said: "I can only speak about this issue in general, however it is up to a court to decide, clearly whether something is in the end a 'crime'. That said prima-facie, there does appear to be evidence of war crimes in this material." The Executive Director of the International Bar Association, Mark Ellis reviewed detailed evidence surrounding one incident in Jalalabad sent to him following a Channel 4 News examination which found the "military" facts did not appear consistent with human rights group findings. Mr Ellis said in his opinion there is "prima-facie" evidence from the military logs of the incident involving US Marines that suggests "the troops could be investigated for war crimes, because of the way civilians were targeted and killed." The Asia-Pacific Director of Amnesty International, Sam Zarifi told Channel 4 News: "There is certainly prima-facie evidence of violations of International Humanitarian law." Channel 4 News has examined the Wikileaks files for any inconsistencies between the military field reports and the evidence presented by other investigations and human rights groups. 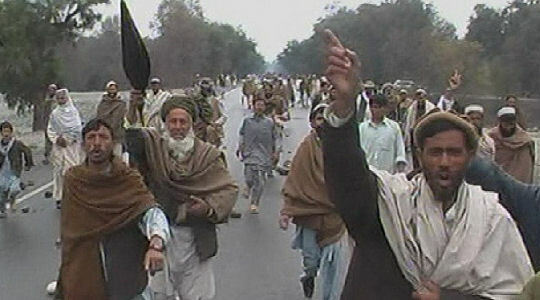 A military report for the 4th of March 2007 suggests some eight people are killed in one incident near Jalalabad but the facts are disputed in a Human Rights Watch investigation which reports the deaths of at least eight and as many as 16 civilians. A third report by the Afghanistan Independent Human Rights Commission reports women and children among 12 deaths. So what happened? This is what the US Marines describe in Field report 23017: Their convoy came under attack by an suicide bomber in a vehicle, near Jalalabad. The unit is said to have come under small arms fire during the detonation of the vehicle laden with explosive devices (IEDs). The log says that small arms fire was coming in at the marines from three directions simultaneously. It says the patrol then returned to Jalalabad air field, as a military police patrol arrived at the scene to determine the number of local nationals (civilians) injured or dead. The specialised bomb-hunting unit Task Force Paladin was notified of the VBIED attack and prepared to respond. The report then states that some 49 minutes later the patrol of marines requested a medical evacuation for one of its men. The private had shrapnel wounds to the arm. He was evacuated from Jalalabad air field to forward operating base ABAD. An hour and 11 minutes later at 0700GMT, the report updates on how many civlians are injured - 28 local nationals are wounded in action. Ten of these were sent to the Jalalabad public hospital, 14 sent to Ghani Khel and four died of wounds at an unspecified location. It says the source who provided the US troops with the wounded in action numbers was the Director of public health in Jalalabad. An hour and 46 minutes later the military report at the scene was updated, taking into account the size, activity, location, time, unit and result of the incident. The report team arrived on the scene and conducted an "exploitation" of the area, including taking photographs and recording GPS coordinates. It says the team also debriefed the Afghan National police (some 100-150 officers) and government officials on the ground. According to the log initial reports suggested that the blast site was a radius of 300 metres. The government officials then requested the coalition forces to leave the site so it could carry out its own exploitation report of the area and enforce crowd control. The team then returned to Camp Torkham after coordinating with the Afghan officials. The report the concludes that the casualty figures include eight civilians killed and 34 civilians wounded. Human Rights groups dispute "facts"
Human Rights Watch, just two days after this incident published a report, calling on the US military to investigate the deaths. In the report HRW claims "at least eight and as many as 16 civilians were killed". However, it also states that its sources reported approximately 25 civilians injured. This is lower than the number reported in the field report of 34 civilians wounded in action. "The AIHRC investigation of the incident found that the large majority, if not all of the victims were civilians. "While the AIHRC condemns the suicide attack, the level of force utilised by US forces in consequence was almost certainly excessive and disproportionate to any threat faced or military advantage anticipated. "In failing to distinguish between civilians and legitimate military targets the US Marine Corps Special Forces employed indiscriminate force. Their actions thus constitute a serious violation of international humanitarian law standards." The Afghanistan Independent Human Rights Commission reported that at least 12 people were killed and 35 injured, including several women and children. During its own investigation to verify its claims, the Commission conducted extensive interviews with victims, their families, eye-witnesses, community leaders, district authorities, local hospitals and representatives of the Afghan National police. It also carried out numerous forensic site investigations at the scene. The AIHRC report suggests that some of the locals denied the IED attack ever took place. But the AIHRC investigation is sceptical about this as its own physical examinations of the site, suggest an IED attack did happen. Snowblog: Wikileaks, war and calling the kettle black? The US militarys report suggests "simultaneously, the patrol received small arms fire from three directions". US military spokesman Major William Mitchell suggested at the time in a BBC television interview: "We believe it's possible that the incoming fire from the ambush was wholly or partially responsible for the civilian casualties". However, the AIHRC investigators said there was little, if any physical evidence that an ambush ever took place. It also says that a great number of the civilians and witnesses it interviewed claimed that a small arms fire attack did not occur. The AIHRC says that the suggestion that the small arms fire was "wholly or partially" responsible for civilian deaths appears to be inaccurate. The AIHRC says that witnesses accounted for six deaths at the scene, but there were some six more civilians shot dead within a 16 kilometre range. Indeed it quotes one witness who says: "I was following a road leading to the main road about 500 metres away from the site of the explosion in the Spin Pul area. There is no mention of this in the field report. In the aftermath of the IED attack, the log states: "patrol then returned to Jalalabad air field". Here, no mention of its troops shooting at innocent civilians some distance away from the attack site as the convoy returned back to base. The AIHRC report then states: "During the next 16 kilometres, the convoy in several different locations opened fire on civilians traveling by foot or in vehicles, causing further deaths and injuries. "The firing killed at least another six people and injured at least 25 more, including several women, children and old men. No evidence was found that any of the vehicles or persons fired on away from the main VBIED site posed a threat to the American convoy or were anything other than civilians." The report says that witnesses claim the marines opened fire at vehicles and pedestrians in at least six different locations on a 16 kilometre stretch. Again this is contrary to what the military log says. It simply states that casualty figures include eight civilians killed and 34 civilians wounded. It goes into no detail as to where or how these people were killed and injured. Another witness, the AIHRC reports, said: "I heard a big blast … after that I heard guns firing. A Coalition Forces vehicle arrived at my fuel station and opened fire on me and on labourers working beneath the [nearby] bridge. The report says another witness said he was fired upon in his car some 15 kilometres from the original incident. 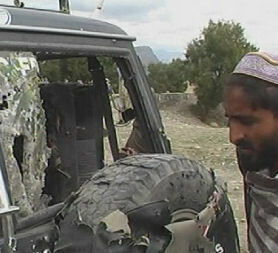 He is quoted as saying: "There is no reason why they should have fired on the car, we were quite a long distance away." Again, the leaked military report does not mention this later incident and does not report how the civilians were injured or killed. The AIHRC report claims that the marines then returned to the scene of the original attack to "clean-up" the site, removing bullet shells and cartridges. The report then says that the Afghan National Police were not allowed access to the area until after the military had completed its "clean-up". This does not concur with the leaked military report, which suggests "The report team arrived on the scene and conducted an "exploitation" of the area, including taking photographs and recording GPS coordinates". The AIHRC then claims: "In the aftermaths of the attack several journalists were hindered from accessing the site and some were expressly threatened and forced to delete all pictures and videos they had taken. "This obstructed the ability of the media to seek, receive and impart information about the incident and so constitutes a violation of the right to freedom of expression." The AIHRC report alleges that seven journalists at the scene of the SVIED area claimed their work was hindered substantially by the marines. However, the AHIRC report suggests this does not concur with its witness statements. Earlier the Guardian reported that the US military held an internal inquiry into the Shinwar incident. It states: "The inquiry lasted 17 days and heard from 50 witnesses, including Afghans who testified by videolink. But it did not hear from the four soldiers who fired their weapons, because they had not been granted immunity from prosecution. "The findings of the court of inquiry, which ran to 12,000 pages, were not released. No criminal charges were brought against any officer, although some did receive an "administrative reprimand". "As the war logs might have put it: "Event closed"." In the Geneva Convention of 1949 are the international treaties that contain the most important rules limiting the barbarity of war. Essentially they are the core of international humanitarian law. In article three of the Geneva Convention 1949, it states: "Persons taking no active part in the hostilities, including members of armed forces who have laid down their arms and those placed hors de combat by sickness, wounds, detention, or any other cause, shall in all circumstances be treated humanely." The rule that civilians must under no circumstances become the direct target of an attack, as reiterated in art.8(2)(e)(i) of the 1998 Rome Statute of the International Criminal Court, is fundamental to the established law of armed conflict and undoubtedly part of established customary international law. The Executive Director of the International Bar Association, Mark Ellis told Channel 4 News that there is "prima-facie" evidence from the military log that suggests the troops could be investigated for war crimes, because of the way civilians were targeted and killed. However, he said that there are legal hurdles that would probably prohibit action being taken. He said: "One might generally see the International Criminal Court (ICC) securing jurisdiction over the alleged crimes. So we ask who is a signatory of the ICC Rome Statute of 1998? We know the US is not, but we also know that Afghanistan is a signatory. It became a member state in 2003. "So the Afghan ratification of the ICC Rome Statute of 1998 means that 'war crimes' allegedly committed in Afghanistan, can in fact be enable to ICC to gain jurisdiction over the troops for those alleged crimes. "But there's a big exception. The article 98 agreement. This agreement was signed by the US with Afghanistan. In essence it permits the US military to enter into Afghanistan, without the risk of its troops being sent to the Hague to face criminal action, even if the ICC appears to have jurisdiction. "So it's a loophole if you will. The US went around a hundred or so countries and said 'listen - you asked us to come in and assist in military action, but we're not going to be liable with the International court. You have to sign this agreement (Article 98)'. "The other option is the concept of universal jurisdiction - in that if this was found to be a grave breach of the Geneva Convention, there seems to be prima-facie evidence because of the civilians killed, other third party states could bring these troops in for investigation and into jurisdiction. ""So if a third party state feels these crimes are so heinous, that they want to take legal action against them, then there is a possibility it could happen. But, they'd (third party state) would need the troops to wander into their jurisdiction in order for them to arrest them. There are a lot of hurdles." The Asia-Pacific Director of Amnesty International, Sam Zarifi concurs with Mr Ellis. Mr Zafiri told Channel 4 News: "There is certainly prima-facie evidence of violations of International Humanitarian law. "For the US it's also about violations of the military's Rule of Engagement - which are sometimes even tougher. "It's not so much about whether an investigation into what happened at Jalalabad is re-opened, but rather publish what the US military did investigate, who they talked to, what were the results and how did they arrive at the decision they came to. "There is not just systematic under-reporting of civilian deaths. This is a clear example of incoherence and an ineffective system of accountability. "This incident was one of the major incidents leading to the US and Nato putting in place new Rules of Engagement in 2008-09, which increased the protection of civilians. "The immediate reporting on the ground from troops was faulty. Nato leadership didn't know what was happening on the ground, but they rushed out a press release denying culpability - but as more and more information came in, they were forced to retreat and retreat." Regarding the Afghanistan Independent Human Rights Commission, Mr Zarifi told Channel 4 News: "They have access to locals and they ask the questions no one else asks. They are mandated to do so under the Afghan consitution and they've been paid thousands of dollars by US Congress to do so. "They are independent, although operationally, they come under huge political pressure. They are one of the most effective institutions in post-Taliban Afghanistan."